Walk south on Michigan to Randolph Street. The site of the Michigan Avenue Bridge marks the point of origin of the settlement of Chicago. The cabin of Jean Baptiste Point du Sable, Chicago's first permanent resident, was located near the north pylon of the bridge in what is now Pioneer Court. Fort Dearborn stood on the south bank of the river. Sidewalk markers commemorate the military base established here in 1803. The bridge, part of the 1909 Burnham Plan for Chicago, opened in 1920 and paved he way for the development of the Near North Side. Within ten years the old warehouses that once lined the river disappeared and were replaced by the office buildings which still accent this entranceway to the city. 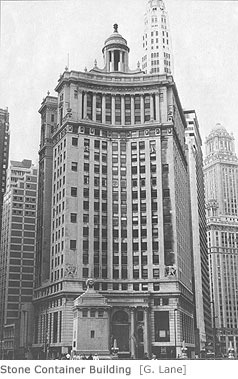 Alfred S. Alschuler designed the Stone Container Building (1923) at the southwest corner of Wacker Drive and Michigan Avenue. This structure, originally know as the London Guarantee Building, is distinctive for the Greco-Roman lantern on its roof. It faces the Chicago River and with the Wrigley Building forms an impressive architectural gateway to the city. The photograph above shows the Stone Container Building in 1985. Across Michigan Avenue at the southeast corner is the 333 North Michigan Avenue Building (1928) designed by Holabird and Root. This Art Moderne structure includes exquisite elevator doors done in relief by Chicago artist Edgar Miller. 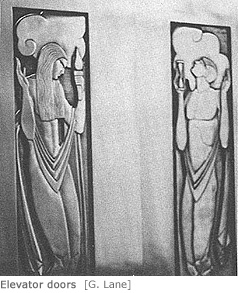 The photograph to the right, taken in 1985, shows a pair of elevator doors in the Michigan building which carry figures sculpted by Edgar Miller. One block south at 230 North Michigan stands the Carbide and Carbon Building by the Burnham Brothers, sons of the great planner and architect. This forty-story structure was designed just before the Great Depression. It is distinguished by a dark green and gold terra-cotta tower. Proceed south on Michigan Avenue, turn right at Randolph, and walk three blocks west to Dearborn Street. The Cultural Center of the Chicago Public Library stands on the southwest corner of Michigan and Randolph. Originally built as the city's central library in 1897 and designed by Shepley, Rutan, and Coolidge, this building was thoroughly renovated in 1977 under the guidance of the firm of Holabird and Root. Included in the Cultural Center is the large G.A.R. Museum dedicated to the Northern Soldiers of the Civil War. This building marks the north end of the Michigan Avenue cultural district. Once the street was built up with cultural institutions and businesses, the area immediately to the south of Grant Park became a cultural "annex" of Michigan Avenue. The Field Museum of Natural History, the Shedd Aquarium, and the Adler Planetarium are located along the lakefront south of Roosevelt Road.